Fynbos Estate is a 320ha property on the Paardeberg acquired by Johan and Diana Simons in 1997 which today incorporates some 16ha of vineyard and a nature reserve while also offering accommodation and function facilities. Johan, a former molecular biologist and a long-time wine enthusiast, initially made some wine for fun in 2006 but has been giving this endeavor more attention ever since and is now a signed-up member of the Swartland Independent Producers movement. 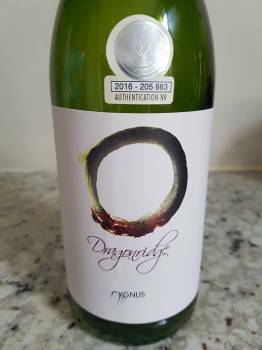 The stand-out current release is the Cygnus 2015, grapes sources from various bush vine blocks apparently aged between 25 and 90 years old, winemaking involving spontaneous fermentation and a week of skin contact before a year of maturation in second-fill barrels. The wine possesses a definite love-it-or-hate-it oxidative character – notes of bruised apple, dried peach and its kernel plus a little spice on the nose, the palate showing good fruit concentration offset by zesty acidity. Some might find it a bit too quirky but I liked it quite a bit. Price: R90 a bottle.